BOOM! 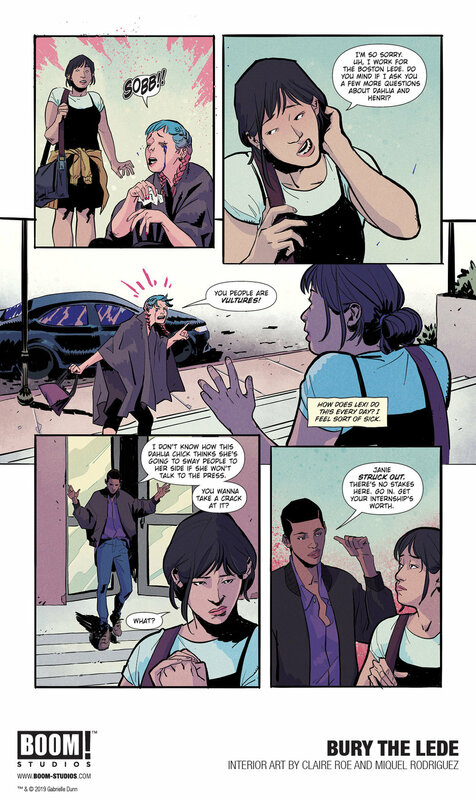 Studios gives us our first look at BURY THE LEDE, a new original graphic novel from New York Times bestselling author Gaby Dunn (Bad with Money, I Hate Everyone But You) and artist Claire Roe (Batgirl and The Birds of Prey), with colors by Miquel Rodriguez, which arrives in stores October 2019. Inspired by Dunn’s own experiences as a young reporter at The Boston Globe, BURY THE LEDE is a thrilling story about a young reporter’s search for truth leading her down a dark path while she goes toe-to-toe with a potential killer. Cub reporter Madison Jackson is young, scrappy, and hungry to prove that she deserves her coveted college internship at the premier newspaper in town, The Boston Lede, where she dreams of a career-making headline. So when her police scanner mentions a brutal murder tied to a prominent Boston family, Madison races to the crime scene, looking for the scoop of the century. What she finds instead is the woman who'll change her life forever: Dahlia Kennedy, a celebrity socialite covered in blood and the prime suspect in the murder of her husband and child. When Madison is the only person Dahlia will speak to, everything rides on the untested shoulders of this young journalist who sinks ever deeper into the dark, twisted landscape of the city’s hidden circles of crime, corruption, and privilege in order to unveil the truth. Dunn has distinguished herself as a New York Times bestselling author, journalist, YouTuber, actress, comedian and television writer. She and her comedy partner, Allison Raskin, created the successful YouTube channel Just Between Us along with the novel “I Hate Everyone But You,” published under Wednesday Books’ inaugural list, an imprint of St. Martin’s Press, with a sequel to be published in 2019. She has written for The New York Times, Cosmopolitan, New York Magazine, The Boston Globe, and Vulture, as well as a finance column for Marie Claire. Dunn served as a writer on "Big Mouth” (Netflix) and in 2016, co-created and starred in a pilot for MTV, later developing original half-hour pilots for Netflix, 20th Century Fox, YouTube Originals, and FX, as well as joining the cast of “Take My Wife” (Starz) in the role of Brie. She is also the host and creator of the podcast, Bad With Money With Gaby Dunn, which has been featured as one of the “Best New Podcasts of 2016” by The New York Times and Vulture. The show is entering its 4th season and a book based on the podcast was published by Simon & Schuster on January 1st, 2019. BURY THE LEDE is Dunn’s graphic fiction debut release. Claire Roe is an acclaimed artist from the east of Scotland and studied animation at Duncan of Jordonstone College of Art, graduating in 2013. She has distinguished herself with dynamic work on some of the biggest properties in comics, includingWonder Woman and Batgirl and The Birds of Prey from DC Comics, Halo: Rise of Atriox from Dark Horse, The Wicked + The Divine from Image Comics, and Welcome Back from BOOM! Studios. BURY THE LEDE will be available for sale on October 2, 2019. 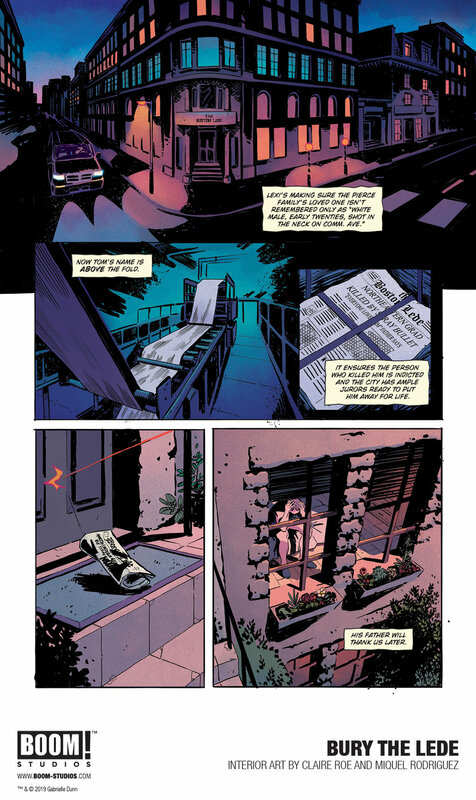 Are you excited for a psychological thriller in comic book form? Let us know in the comment section below. Also, Don’t forget to like, share and subscribe to all things Constant Collectible to keep up to date with all the news and reviews from a world of GEEK CULTURE.